If you’ve tried fried zucchini sticks and fell in love, you’re in for a real treat! The best news is, these eggplant fries aren’t actually fried. They’re baked! They’re crispy and include a great herb mixture that is sure to satisfy. Serve with marinara sauce or a spicy mayo, if you choose to. Put your rack near the top of your oven and make sure there is space for your baking sheet and eggplant. Set the oven to the broil setting. 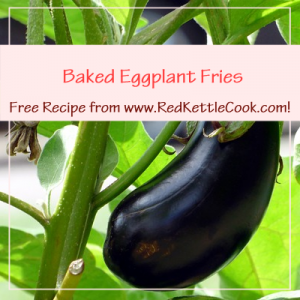 Cut your eggplant into wedges, making them fairly thin, so the eggplant will soften when you broil it. Set aside. Whisk the eggs into a shallow bowl or baking dish. Set aside. Combine the breadcrumbs, Parmesan, oregano, basil, salt and pepper in a shallow bowl or baking dish. Set aside. One by one, dip your eggplant wedges into the egg mixture and then the breadcrumb mixture, ensuring it’s completely coated. Place each wedge on a greased baking dish as you complete them. Broil for 3 minutes per side. They’re done when they’re golden brown.